)The anchors must be close enough for the 150 foot coil to reach both near side and far side anchors. Keep in mind that it will take approximately 1/3 of the 150 foot rope for tightening and anchoring of the bridge. Azimuth Method. Shoot an azimuth to a point on the far side of the intended obstacle to cross. Then move LEFT or RIGHT (perpendicular to the azimuth) until you get a 15 degree offset of your previous azimuth. Next, measure the distance that you paced in feet from your first azimuth to your second azimuth, and multiply that distance by three. This total will give you the approximate distance across the obstacle in feet. Unit Average Method. Get three Marines to judge (best guess) the distance across the intended obstacle. Add up the total accumulated distance, then divide by three. This will give an estimation of the distance across the obstacle. 9 The Bridging Team - consisting of the bridge NCO and another Marine. 9 The Safety Line Team - consisting of the lead swimmer and his belay man. 9 The Mule Team - consisting 3 Marines for a 9:1, and 6 Marines for a 3:1. 0 The Security Team - consisting of the rest of the party. 4| (15 Min) CONSTRUCTION. This bridge is ideal for squad and platoon sized units, for its quick construction and minimal amount of equipment required. 3 At the same time as the lead swimmer is crossing, the bridging team will be preparing the near side anchor. The bridging team will tie a swammi wrap around the anchor, using a sling rope or practice coil, and ensuring the square knot is behind or on the side of the anchor. Once the anchor is secure, flake out the bridging line in order to send it across. 9 Once the lead swimmer is across he will move to the site where the far side anchor will be established and secure his rope. The belay man will then move down to the near side anchor, and as close to the waters edge as possible. He will attach the bridging line to the safety by tying a middle of the rope in a figure 8 knot to the safety line and an end of the rope figure 8 knot to the bridging line connecting the two ropes with an 85 carabiner. The lead swimmer will then pull the rope across. The belay man with the help of another Marine will belay the bridging line across keeping tension on the rope to keep the rope out of the water. d After the bridging line is across the lead swimmer will detach the bridging line from the safety line and secure it to the far side anchor using a tree wrap, wrapping from right to left, ensuring there are 3-5 wraps. 9 Once the bridging line is secure. The lead swimmer and the belay man will secure the safety line on both banks, ensuring the rope is creating a ferry angle (minimum 45 degrees). This will be the safety line for the Marines crossing the bridge. NOTE: If a fall from a rope bridge would result in death or serious injury, then utilize a safety line that will be anchored parallel with the bridge and hand tightened. The Marine crossing will clip into both ropes prior crossing. 2 Once the bridging line is secured on the far side, the bridging team will take one 85 and clip it into the near side anchor (swammi wrap). Then they will take the bridging line and clip into that 85, then using one three foot long prusik (16" loop) the bridging line will be secured to the 85 by tying a French Prusik, which will act as a braking knot. The bridging team will now pull the rope taut, and begin construction of the mechanical advantage. 3| The first step is to take one three foot prusik (16" loop) and tie a French prusik on the bridging line as far away from the anchor as possible. Then take one 85 and clip it to the loops of the French prusik. 4. Taking a bight from the running end of the rope clip it into the 85 hanging from the tails of the French prusik. 5 Then bring a bight back from the clipped in rope to the anchor, and taking one 85 clip it into the 85 created in step (2), take the bight of rope and clip into this 85. 7. From the anchor, take a bight of rope from the 85 created in step (6) and clip it into the 85 created in step (6). 8 You have made approximately a 9:1 mechanical advantage. 01 Now that the bridge is built, the bridge NCO can call up the mule team to tension the bridge. 2 This procedure is facilitated by the mechanical advantage system that was just put into place. The braking knot (French prusik) is used to hold tension on the bridging line while the bridge is being tensioned. 3| The mule team will begin to pull on the running end of the rope coming out of the mechanical advantage. They will pull the rope straight back, trying to keep it in line with the bridge as best as possible. The mule team will tension the rope as much as possible, the bridge NCO will monitor the system. Once the mule team cannot pull anymore tension, the bridge NCO will then have them hold the rope in place, and will reset the braking knot. Once the braking knot is set the bridge NCO will ask for slack from the mule team and cycle the system out. This process will continue until the bridge is tight. 5 On the last cycle the bridge NCO will set the brake knot and with the help of another Marine they will make a bight out of the running end and bring it around the tree while keeping tension. 6 Take a bight and make a complete round turn on the body of the 85 created in step (2). Last, the bridge NCO will tie two half hitches encompassing all the ropes just behind the anchor. 7. At this stage the bridge is tight and secured, the bridge NCO will now call up the remainder of the squad/platoon to cross. The bridge NCO will monitor the crossing of all Marines, and will be the last one to cross. TRANSITION: Now that we have discussed the construction of the bridge, are there any questions over the material? Next we will discuss the crossing of the bridge. 5 (10 Min) CROSSING. The method used to cross is known as a horizontal traverse. This traverse can be accomplished in the following ways. )The Marine hangs below the bridge from his rappel seat with his head pointing in the direction of the far anchor and allows his legs to hang free. ulling with his arms makes progress. ^^This method is the safest and therefore the preferred method. ^^If the Marine must take a pack across, he may wear it with the waistband secured: However, the preferred method is to have another carabiner (aluminum non-locking is sufficient) attached to the pack frame at the top and attach this to the bridge behind the Marine putting his legs through the shoulder straps and pulling the pack across with him. ¡^HOne man at a time will cross, although one can load and another can unload concurrently. ^BWeapons will be worn across the shoulder; muzzle down with a tight sling securely attached to the weapon. 9 Pulley Method. This method is used when the one rope bridge is long, uphill, or speed is vital and the Marines crossing it have a lot of heavy personal equipment; M24OG's, radios, etc. quipment required. One pulley, four steel locking carabiners, and a hauling line twice the length of the obstacle. ^Setting up the system. Construction of the first suspension point is done by attaching a pulley to the one rope bridge, one 85 carabiner is attached to the pulley, gate down, and a second 85 is attached to the first 85 with the gate facing the near side bank. Into this second 85, attach the hauling rope with a figure-8 loop. The figure-8 is placed halfway along the hauling rope and attached to the 85, which is then locked. Four feet down the line another figure-8 on a bight is placed into the second suspension point. ^^Connection. The Marine clips his 85 into the lower 85, his equipment is clipped into the second 85. The mule team starts to pull. 9 Helmets will be worn for all methods of crossing the bridge. Gloves are optional. NOTE: There are additional methods of crossing a one rope bridge such as the Commando crawl, Monkey crawl and hand over hand techniques, however, they are not taught at MWTC due to safety reasons. TRANSITION: Are there any questions over crossing? Now we will cover rescue techniques. 9 Throw. If reaching the victim is impossible, try throwing a rope to the victim and have him attach the rope to himself, preferably his seat, and pull him back to the desired side of the installation. 9 Tow. If the victim is unable to catch or reach a rope being thrown to him or the victim is unconscious, tie a figure-of-eight loop into the middle of the safety line and then connect the rope to the rope bridge with a steel locking carabiner. The mule team will pull the carabiner up against the victim's seat and begin towing the victim to the desired side of the installation. The rope used to tow the victim should be twice the length of the span of the rope bridge (If necessary, ropes can be tied together to accommodate the span). This will allow towing from either side without having to throw or have a Marine carry the safety line back across the bridge each time a towing rescue is performed. 3 Go. If all else fails, the last option will be to go after the victim. The rescuer will move out onto the rope bridge with a safety line attached to himself at approximately eight feet from the end of the safety line. In the end of the safety line tie a figure-of-eight loop and insert a steel locking carabiner in the end of it. Once the rescuer has made contact with the victim. 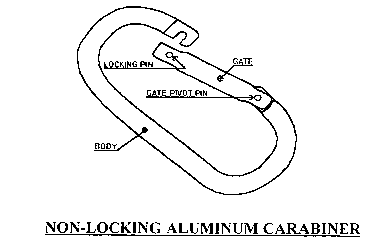 He will attach the steel locking carabiner to either the victim's seat (preferably the victim's carabiner that is attached to the rope bridge), or to the bridge itself. To ensuring that the carabiner is placed so that it pulls against the victim's carabiner. The mule team now starts to pull both the victim and the rescuer to the desired side of the installation. 3 Cut. If while crossing the rope over water the individual goes underwater and no other rescue technique can be employed, the rope will be cut. TRANSITION: Are there any questions over rescue techniques? Now we need to know how to retrieve our ropes.